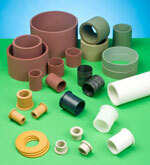 Jade’s JLON PTFE stock bearing shapes imbed into shafts, creating a surface interface. The shapes feature four wear-resistant formulations with no water absorption and are offered in 3.8- to 36-inch O.D. sizes. The products are available in the 2100, 4200, 5500 and 7000 models.